Picture - Fairey Firefly Y-17 from 3/II/2 A� (Red Cocottes) Squadron in flight near its home base at Nivelles. Fairey c/n F-1505 was delivered from Fairey Hayes (UK) on 21 August 1931. The Fairey Firefly IIM was a British fighter of the 1930s. It was a single-seat, single-engine biplane of all-metal construction. Built by Fairey Aviation Company Limited, it served principally with the Belgian Air Force throughout the 1930s until the outbreak of World War Two. The Firefly was a private-venture design, penned by Marcel Lobelle. A completely new design, it shared little with the Firefly I beyond the name. Making use of experience gleaned from the earlier machine, it was developed in response to Specification F.20/27 for a single-seat interceptor. It first flew on 5 February 1929. The Firefly II competed for the RAF contract against the Hawker Fury, showing superior speed but was criticised for having heavier controls. Crucially, it retained a mainly wooden structure despite the Air Ministry's demands for metal structures. This led to the Fury being selected. Afterwards, the prototype was rebuilt and renamed Firefly IIM, the "M" denoting the all-metal construction of the rebuilt machine. 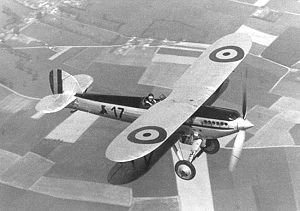 A revised prototype with longer-span wings, the Firefly III was built to Specification N21/26 as a carrier-based fighter to replace the Fleet Air Arm's Fairey Flycatchers, first flying on 17 May 1929. Like the land-based fighter, it was rebuilt with more metal components as the Firefly IIIM, and again like the Firefly II, was beaten by a design produced by Hawker, in this case the Hawker Nimrod. Although no production orders ensued, the Firefly IIIM was fitted with floats and used as a trainer by the RAF's High Speed Flight preparing for the 1931 Schneider Trophy race. A contract was won for 25 IIM aircraft for Belgium's A�ronautique Militaire, followed by a contract for a further 62 to be constructed by Avions Fairey, Fairey's Belgian subsidiary. The Belgian aircraft served briefly in the Second World War from May to June 1940. Two of the Belgian aircraft were converted to Firefly IV, with 785 hp (585 kW) Hispano-Suiza 12Xbrs engines but the improvement was not deemed sufficient to warrant development. One was restored to its original form, while the other passed to Fairey for trials. One aircraft was supplied to the Soviet Union. Fairey Firefly II Single-seat fighter prototype, powered by a 480 hp (360 kW) Rolls-Royce Kestrel piston engine. One built. Fairey Firefly IIM Single-seat single-engine fighter aircraft, of all-metal construction, equipped with resigned tail surfaces and revised engine cooling system. Fairey Firefly III Single-seat shipboard fighter prototype. One built. Fairey Firefly IIIM The Fairey Firefly III was rebuilt with all-metal construction and resignated Firefly IIIM. Fairey Firefly IV Two Belgian Firefly IIs were converted, and fitted with the 785 hp (585 kW) Hispano-Suiza 12Xbrs engine. Pacco, John. "Fairey Firefly" Belgisch Leger/Armee Belge: Het militair Vliegwezen/l'Aeronautique militaire 1930-1940. Artselaar, Belgium, 2003, pp. 32-38. ISBN 90-801136-6-2. Taylor, H.A. Fairey Aircraft since 1915. London: Putnam, 1988. ISBN 0-370-00065-X.